It's 1956... I Love Lucy is America's most popular television show. My Fair Lady makes Broadway history. Peyton Place is the nation's most scandalous best seller. The United States tests the first aerial hydrogen bomb. The interstate highway system, the most massive public works project in history, finally gets underway. Marilyn Monroe weds playwright Arthur Miller. Mickey Mantle carries the New York Yankees to another pennant but the year's most wildly heated topic of conversation is the explosion of rock & roll, symbolized by a young singer named Elvis Presley. There was no model for Elvis Presley's success. What Sam Phillips sensed was something in the air, an inevitable outgrowth of all the country and blues he was recording at his Memphis studio. By the time Presley walked into that studio one day in 1954, he was carrying with him a musical vocabulary rich in country blues, gospel, inspirational music, bluegrass, contemporary country and popular music - as well as a host of emotional needs that found their best expression in song. And his timing was impeccable: emerging in the first blush of America's postwar excitement, Elvis Presley captured the spirit of a country flexing its industrial muscle, of a generation unburdened by the concerns of war, more mobile, more affluent and better educated than any that had come before. By the time he died, on August 16, 1977, it could be said that his death deprived America of a part of itself. He changed the face of American popular culture and he was a symbol to people the world over of the vitality, rebelliousness and the good humor of the country. With more than a hundred Top-40 hits, thirty-eight Top-10 hits and eighteen #1 records, Elvis Presley remains the undisputed King of Rock & Roll. Elvis Elvis Elvis is the only comprehensive tribute to Elvis in North America. It is a completely "live" Tribute to the King. The key to the success of the show is that three different performers have been cast in the role of Elvis Presley - each representing a different decade of his phenomenal career. An incredible Trilogy of Elvis entertainment. The faces, the costumes, the sound, the movements and the songs combine to create an incredible illusion. Mark Friebe, who is a regular in Las Vegas, reprises his signature role from The Legends of Rock N Roll with a remarkable version of a young Elvis Presley. From London, England, Clayton Mark gives a stunning performance as the leather suited superstar of the sixties. Douglas Roy is the only known impersonator to have shared the stage with Elvis Presley and his band before a live audience. 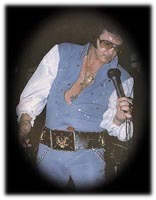 On May 6, 1976 at Lake Tahoe, Nevada Elvis invited Roy on stage from the audience to perform. He turns in a superb portrayal of the King of Rock & Roll during the seventies.